Happy Halloween weekend! Instead of a recipe today, I'm sharing an idea for a spooky - and edible - creation that you can make for Halloween. After seeing these crow claws on Betty Crocker's site, I loved the concept of creating creepy hands using cashews as fingernails, so I set out to create something similar myself. Somewhere along the way, I came up with idea of carving a sweet potato. 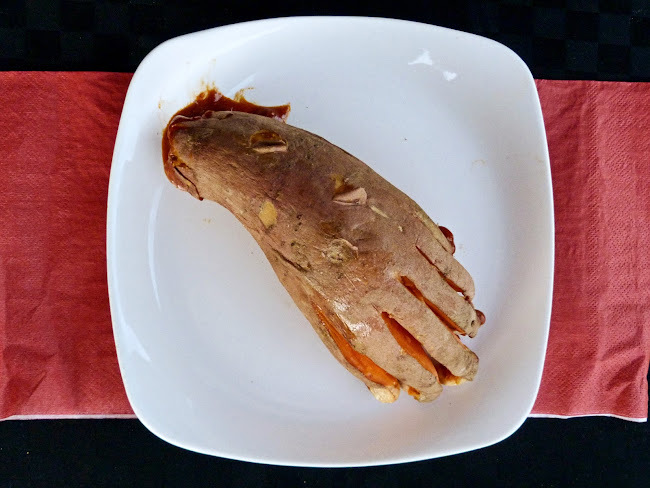 I wasn't sure if it would actually work, but the sweet potato turned out to be the perfect material - the outside skin of the potato had the scraggly texture that I imagine a zombie's skin would be like, and the shape of the whole potato was perfect for carving out a wrist, hand, and fingers! Here's how the potato looked as I was carving it. It doesn't have to be perfect - as you can see, my hand ended up having six fingers by accident! 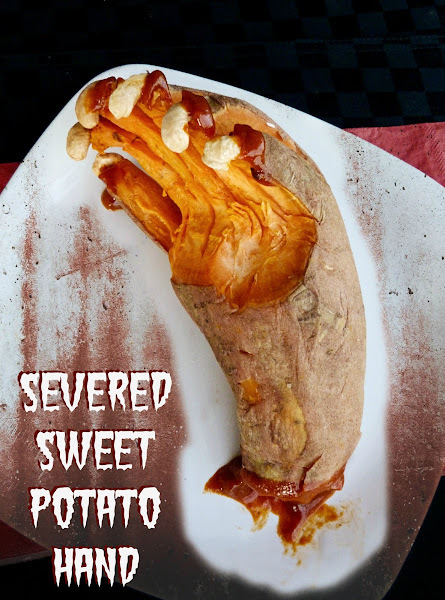 Once the potato is carved and fully cooked (unless you don't plan on actually eating it afterwards, in which case you can leave it partially cooked), you can add the creepy special effects! To make my severed hand more realistic, I tore a bit of potato skin off the wrist end and smeared it in ketchup. Next, I lifted the skin at the ends of each fingertip and stuck a cashew in between to act as the fingernails, smeared with a bit more ketchup of course! The final touch was to make small tears throughout the rest of the potato skin to get that decaying skin effect. If you feel too weird about eating your creation after, you can leave it as is and use it as a scary Halloween decoration. If not, feel free to pluck off the fingers one by one, dip them in more "blood", and enjoy! Preheat oven to 400°F. Wash and dry the sweet potato, leaving the skin on. Place sweet potato on a baking sheet and roast in the oven for about 20 minutes. Remove and let cool slightly until it is cool enough to handle. 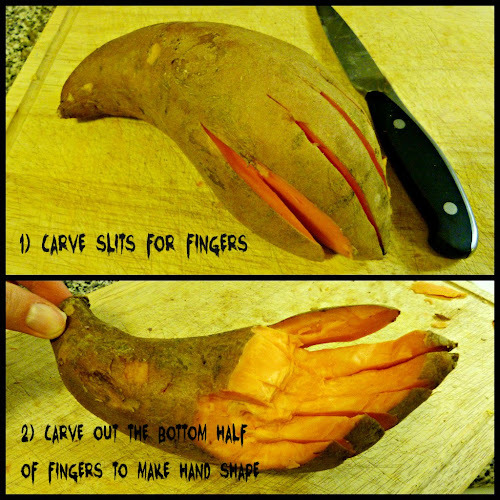 Using a knife, carve slits in the wider end of the sweet potato to create the fingers (if you have an unevenly shaped potato like I did, the skinnier end should be the wrist). Try to cut out a thin slice of potato in between each finger so that they are clearly separated. Then carve out the bottom half of each finger to create a thinner finger shape (see pictures above). Return carved potato to the oven for another 40-50 minutes, until it feels soft when you squeeze it gently (the cooking time will depend on the size of your potato - I only did mine for 40 minutes and the middle was still a bit hard). Remove from oven and peel off the skin from the end of the wrist and from the ends of the fingers. Stick a cashew into the potato flesh of each fingertip right underneath the potato skin. Spoon ketchup onto the wrist and smear. Add a dollop of ketchup to each fingertip around the cashews. Thanks Janet! I wasn't going to attempt a Halloween post this year, but I'm glad that I did - it was fun! This is both gross and awesome :) It's funny when I saw this in my reader I thought it was a Fork & Beans post- but I love that you mixed it up and got spooky! I love the spooky font in the pics too! Haha...at least this is the one time of year when creeping out my readers is acceptable (at least I hope so! )...I wasn't expecting it to turn out so realistic either! Hahaha this is so creative and awesome - you created the perfect vegan zombie hand! i love this hand.. so real and fun! That's certainly a very inventive idea! I know it's pretty Halloween specific but I've got some sweet potato at home, perhaps I'll try and make these! Really a good idea..Looks delish!